First time buyers get up to $500 down payment or rebate cheque on Focus and Fiesta models! Legal disclaimer: Offer only valid from February 3, 2015 to January 3, 2017 (the “Program Period”) to Ford Credit Canada Limited (FCCL) purchase finance and lease customers. Canadian resident customers who (a) are approved by Ford Credit; (b) have no previous automotive financing history; (c) do not have any derogatory credit; (d) have verified full-time employment (minimum of 6 months); (e) have verified income sufficient to meet ordinary living expenses; (f) have verified maximum vehicle payment-to-income (including add-ons) of 15%; (g) have verified maximum total debt-to-income of 50% (debt calculation including rent); (h) have a verified driver's license; and (i) have purchased all required insurance to operate the vehicle prior to delivery (each a “First Time Buyer”) can receive an incentive equalling the eligible customer's vehicle down payment (up to a maximum of $500) (the “Incentive”) towards the purchase finance or lease or factory-order (during the Program Period) of a new 2015/2016/2017 (as applicable based on availability) Ford Focus or Fiesta (each an “Eligible Vehicle”). Limit one (1) Incentive per First Time Buyer. Eligible Vehicle must be purchase financed or leased and registered in the name of the First Time Buyer. Taxes payable before Incentive is deducted. Not combinable with any CPA/GPC or Daily Rental incentives, the Commercial Upfit Program or the Commercial Fleet Incentive Program (CFIP) or any other Targeted Offer Program including the Graduate Rebate program. See dealer for details. 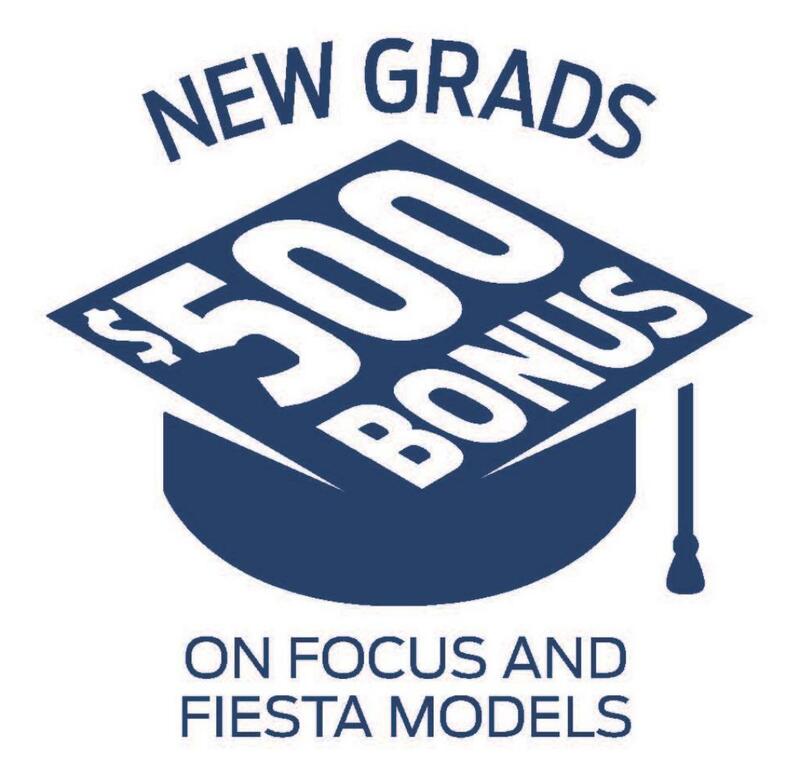 New grads can get a $500 bonus on Focus and Fiesta models. Must have graduated or be graduating within the next 4 months from a university, college, military or police academy. Legal disclaimer: Offer only valid from February 3, 2015 to January 3, 2017 (the “Program Period”) to Canadian resident customers who (a) have graduated, or will graduate (within the next 4 months) from an accredited university undergraduate degree program, or from a two-year (48 weeks minimum) college program, or from a three-year CEGEP D.E.C. program in Quebec; (b) have graduated, or will graduate (within the next 4 months) from a recognized military or police academy; or (c) are a full-time post-graduate student (Masters, Doctorate/PhD) (each an “Eligible Grad”). Eligible Grads will receive $500 (the “Incentive”) towards the purchase, lease, or factory order (during the Program Period) of a new 2015/2016/2017 (as applicable based on availability) Ford Focus or Fiesta (each an “Eligible Vehicle”). Limit one (1) Incentive per Eligible Grad. Eligible Vehicle must be purchased or leased and registered in the name of the Eligible Grad. Each customer will be required to provide proof of status in the form of (a) a copy of the customer's degree/diploma dated within 2 years prior to the vehicle sale date; or (b) an official letter from the Registrar's office confirming graduation within 4 months following the vehicle sale date - the letter must state the Eligible Grad’s name and the length of the program the student is graduating from. Taxes payable before Incentive is deducted. Not combinable with any CPA/GPC or Daily Rental incentives, the Commercial Upfit Program or the Commercial Fleet Incentive Program (CFIP) or any other Targeted Offer Program including the First Time Buyers program. See dealer for details.